Cut eggs lengthwise in half. Remove yolks; place in medium bowl. Mash with fork. Add cream cheese product, Miracle Whip and mustard; mix well. Stir in salmon, relish and onions. Spoon yolk mixture into egg white halves. Place eggs in single layer in saucepan; add enough water to completely cover eggs by at least 1 inch. Bring water boil; cover. Remove saucepan from heat; let stand 15 min. Drain eggs; immediately place in bowl of ice water. Let stand until completely cooled, changing water if necessary. Perfectly hard-cooked eggs will have firm yellow centres with no greenish tinge. 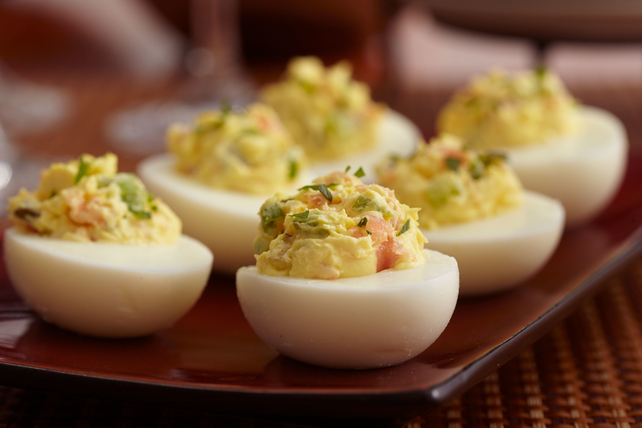 Hard-cooked eggs in their shells can be refrigerated for up to 1 week.